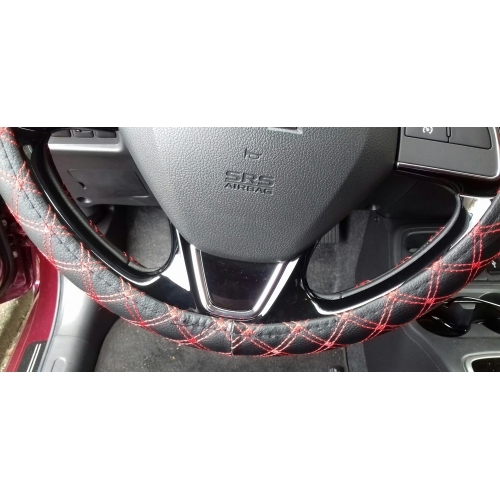 Beautiful steering wheel cover, meets our expectations. fits well with the interior of the car. Mooie stuurhoes, voldoet aan onze verwachtingen. past goed bij het interieur van de auto. Dear Customer, We are very pleased that you have uploaded and shared your photo with other customers. It will be very useful for others to review the products. Thank you again for taking the time to do it, we really appreciate it. Geachte klant, we zijn erg blij dat u uw foto ruimelijk heeft geüpload en gedeeld met andere klanten. Het zal zeer nuttig zijn voor anderen klanten om de producten te beoordelen. Nogmaals bedankt om de tijd te nemen om het te doen, we waarderen dat echt. An elegant steering wheel cover, which is a perfect fit and has a nice colour. Has a good and comfortable grip. An elegant steering wheel cover, which is a perfect fit and has a nice colour. Has a good and comfortable grip. Its difficult to fit at first, but once you get the feel of it its not as hard as you would think. Feels great to hold. Looks great on black interior. its decent item. Would definitely buy again if it breaks, but hope not too quick. Its difficult to fit at first, but once you get the feel of it its not as hard as you would think. Feels great to hold. Looks great on black interior. its decent item. Would definitely buy again if it breaks, but hope not too quick. Nice steering wheel cover, fits nicely with my car, and for reasonable money. Dejligt rat overtræk, passer fint til min bil, og til fornuftige penge. Nicely finished, also the threads to be attached, no loose ends. Good clamping. Keurig afgewerkt, ook de af te hechten draden, geen losse eindjes. Goed klemmend. Product arrived a bit crumpled, but okay due to shipping distance. But in great conditions. Produto chegou um pouco amassado, mas tudo bem devido a distancia do envio. Mas em ótimas condiçoes.